A long journey of everyday waiting characterized by economic difficulties, rising prices of food and other basic commodities and inflation. I don't know how do they live ..
but they are living .. I suggest to hear ziad song .. Bas mashi .. kef mashi ..
eeeh ya majd... bas mashi! ...and we keep grumbling about our lives! omg, Is this man waiting all day to sell a few bunches of weed?! This must be pretty harsh. Ghalia, sorry for asking but what's "Godot"? 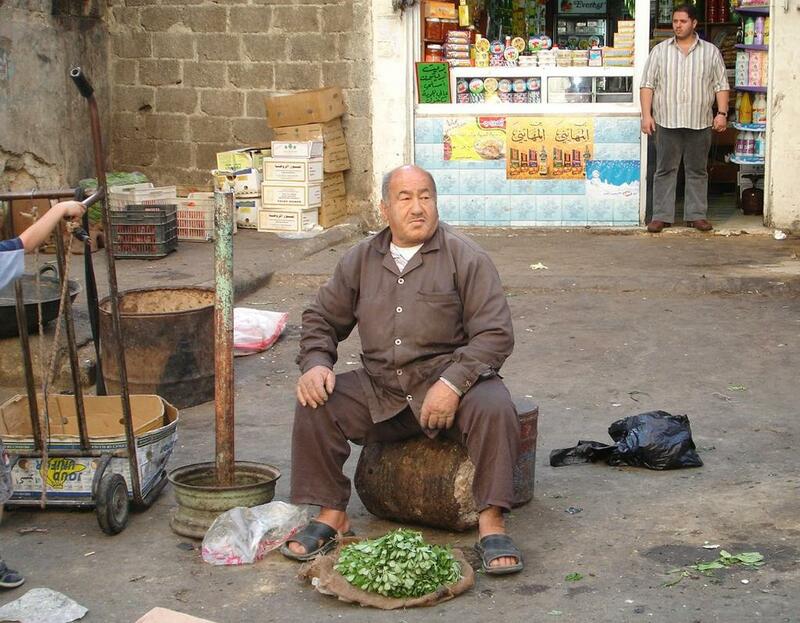 Thanx guys, this man broke my heart, nobody approached him to buy some of his weeds! And even if they did, what will he get, 25 S.P?? I wonder is it enough to buy him anything?!! To Ahmad, thanx for asking so much, and never feel sorry for asking anything since u wanna know! Anyways “Waiting For Godot” is a name of a tragicomedy play by Beckett, from the absurd theater where two tramps do nothing for the whole play but waiting for someone called Godot that he never comes! A symbolic play represents the meaninglessness of modern life! I forgot to add that a lot of ppl now use this expression when they wait for somthing either mistyrious or never come! it's very common and a famous say I guess! Although I didn't hear of it before I read this play! sometimes one picture can capture the whole story of people... especially when words fail to describe..
That was my alms for the mistake ,you may look a Ghada, but you must be proud to be Ghalia for a precious reason . well done Ghalia, once I got passed the title the post really struck me. Got to your site from Kevin Sites stories. I am completely impressed by your stories through the pictures. My tears are just running down my cheeks as I read through the posts. You have done a tramendous job with views from Syria. Keep up the good work!! !